Dress up your entryway, patio, deck or any outdoor living space with the Tierra Verde 28 in. Self-Watering Black Planter. Made from 98% recycled material, this self-watering planter has an elegant look that is durable for all seasons and has a 365 day no crack guarantee. This sleek planter features an interior self-watering system to ensure plants stay properly hydrated. Soil added to the planter perches above a base water reservoir where the plants roots can stretch down out of the soil and into the water for nourishment, keeping your plants healthy and lush. With the bottom drainage plug removed, this planter will protect against over-watering by allowing excess water to drain out a perfect solution if you travel and have difficulty keeping up with the watering needs of your plants. Looking to upgrade your outdoor space. Enhance the look of your patio or front entrance with the Mayne Cape Cod 20-inch Square White Plastic Planter. With rich architectural detail and a clean white finish, you can easily transform your patio into your own personal retreat. A water reservoir creates a self-watering effect to keep your plants looking fresh. 28-inch Planter in Slate Dress up your entryway, patio, deck or any outdoor living space with the Tierra Verde 28 in. Self-Watering Black Planter. Made from 98% recycled material, this self-watering planter has an elegant look that is durable for all seasons and has a 365 day no crack guarantee. This sleek planter features an interior self-watering system to ensure plants stay properly hydrated. Soil added to the planter perches above a base water reservoir where the plants roots can stretch down out of the soil and into the water for nourishment, keeping your plants healthy and lush. With the bottom drainage plug removed, this planter will protect against over-watering by allowing excess water to drain out a perfect solution if you travel and have difficulty keeping up with the watering needs of your plants. 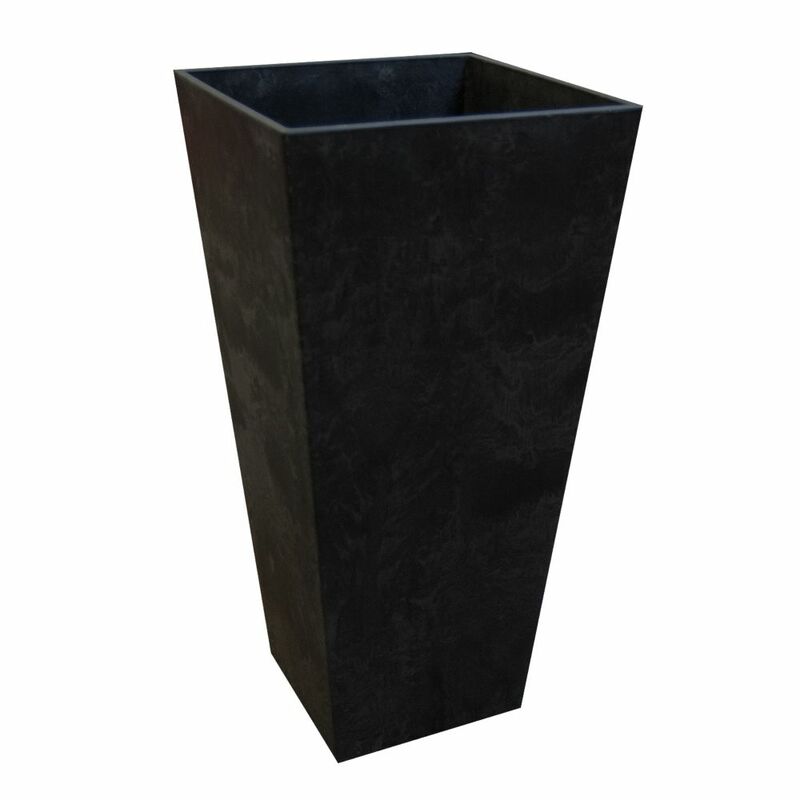 28-inch Planter in Slate is rated 4.7 out of 5 by 166. Rated 5 out of 5 by Nitakay from These are really nice planters; substantial and nice looking. These are really nice planters; substantial and nice looking. Rated 5 out of 5 by Patricia from Excellent year round planter. Flowers in the summer, mums in... Excellent year round planter. Flowers in the summer, mums in the fall and a porch pot for the winter! Materials of the planter aren’t affected by temperatures. Rated 5 out of 5 by Christina1112 from Exactly what I wanted. Accurate description. They are tall planters.... Exactly what I wanted. Accurate description. They are tall planters. Rated 5 out of 5 by Ricky from The best planter that I have ever perchased. The best planter that I have ever perchased. Rated 5 out of 5 by DG from Modern and very durable. I like to put nice plants... Modern and very durable. I like to put nice plants in them outside on our patio where kids and dogs can go wild or if a glass door flies open against one, the glass has a better chance. Little at a time I'm replacing all my glass or ceramic containers with these while saving Mother Earth!